Want to make a shawl? Beloved designer Melissa Leapman has developed an innovative technique that promises hundreds of beautiful shawl design options. 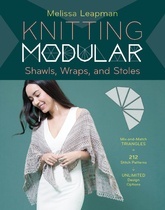 In Knitting Modular Shawls, Wraps, and Stoles you’ll see how it can all start with a simple triangular wedge. Join these together to create square, rectangular, trapezoidal, and semicircular shapes. Melissa’s easy and customizable technique offers knitters of all levels endless flexibility in design and yarn choices. Charted patterns for 185 different stitch patterns allow readers to select their favorite for the main fabric of their shawl. Colorful photographs of 20 of Leapman’s original designs illustrate just a small taste of the beautiful possibilities in store for you.